I created the dress below this weekend using Butterick Pattern 4176. I added more buttons along with the bows at the shoulders. This was my first attempt at creating pleats, which are a little off center and adding a lining, which was not called out in the pattern. Let's just say that the dress turned inside out looks totally different that what the photo shows. As my dear friend Mary once said...the more you sew, the less you notice the imperfections of a garment. I have resolved to not purchase another summer/spring dress for Kayden, so be on the lookout for a few more pieces. Thanks for stopping by! 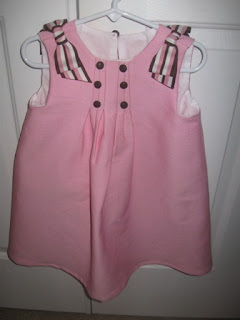 I love this Chocolate and Pink dress! I do not think that you are going to have to purchase Miss Kayden any spring or summer dresses, just the shoes and accessories! You are awesome girl. I guess I will need to place my orders in with you in advance! LOL! I need to pull my own sewing machine back out when things slow down. Keep the dresses coming. You are still inspiring me to start back sewing. And never point out the imperfections to others! I can't tell the pleats are off center and never would have notices and no one ever will. So, just accept them as part of the loveliness of being homemade!